This isnât your young teenâs romantic vampire novel, this is an epic story of blood, death and a horrifying battle between man and vampire. The story starts out with Dr. Ephraim Goodweather of the Centers for Disease Control, part of the rapid-response team that investigates biological threats, investigating a plane at the JFK airport that had arrived from Germany. He finds all but four of the planeâs passengers and crew dead, drained of blood. Despite Ephraimâs efforts to keep the four survivors quarantined, they get discharged into the general population. Soon after, the corpses of the plane victims disappear. Ephraim then begins to believe the wild and crazy stories of Abraham Setrakian, an elderly pawnbroker and determines that a master vampire has arrived in the U.S. Now Eph and Abraham, with the help of others must stop the vampiric virus spreading through the city before it is too late. The Strain mixes classic vampire mythology with new inventive ideas, giving a whole new spin to the vampire and horror genres. 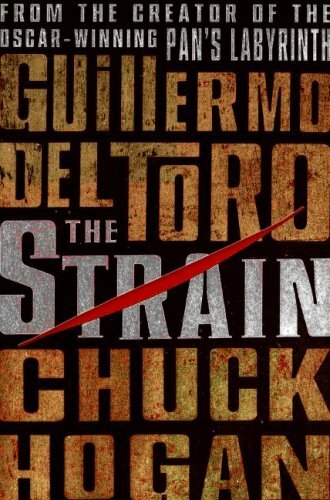 The Strain grabs readers by the neck and pulls them into a dark corner of suspense and thrills. A must read for fans of intense suspense thrillers and vampire horror. Want to know more? Check out the video below featuring author Guillermo Del Toro as he speaks about his love for vampires and discusses The Strain Trilogy. Interesting take, horrific vampires. It brought back some of the classic spookiness of the vampire… stakes and coffin lairs. But it also juxtaposed this with modern times, the whole thing starting with an airplane and a fear of a terrorist attack. It also brought to mind “The Plague” – Camus. The rats! It was great, intertwining ancient lore, strigoi and such, with a vampire threat come to life. It was interesting, concepts of terrorism, genocide, and so on. I actually want to read the next two books. Though… I do think the whole series could probably have been minimized to 1 book. It did go pretty slowly, but perhaps it was necessary to build suspense while also weaving in some symbolism and pretty prose here and there.